Doggone It, The World Can Wipe Out Rabies : Goats and Soda Rabies kills tens of thousands of people each year. Now scientists are hoping to mount a final siege against the virus globally. The trick? Getting all of our four-legged friends in for a shot. Boys show off their four-legged friends at a rabies vaccination drive set up by the Serengeti Health Initiative in the Bariadi District of Tanzania. The word "rabies" may draw faint memories of Old Yeller or Cujo. Thanks to an effective vaccine for dogs, the deadly virus has been nearly eliminated in the U.S. But rabies is still a problem in many parts of Africa and Asia. The virus kills more than 69,000 people each year, many of them children. Now scientists say that doesn't need to be the case. 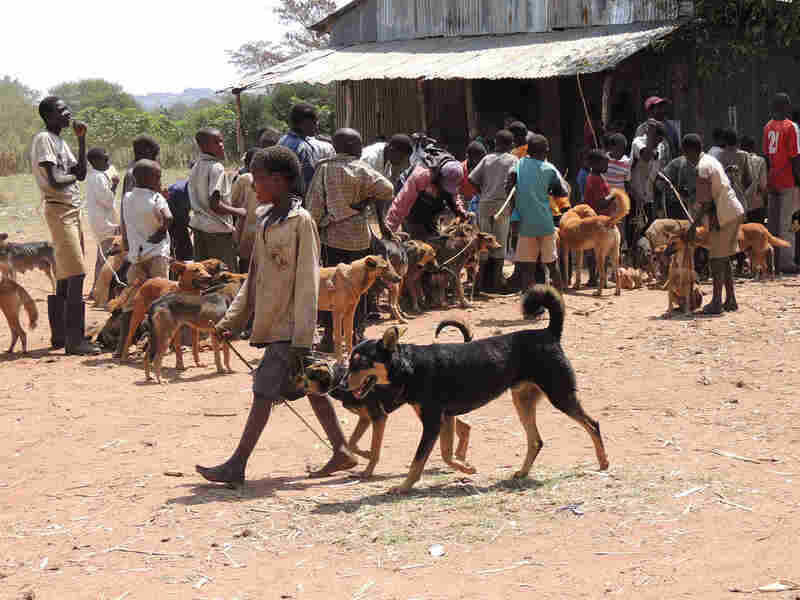 An international team of veterinarians have outlined a plan for eliminating human rabies. Stamping out the disease not only will save lives but may also save countries money, the team wrote Thursday in the journal Science. The dog parade: Vaccinating about 70 percent of dogs is enough to eliminate rabies from an area, researchers have found. To stop rabies in people, health workers around the globe need to vaccinate about 70 percent of the world's dog population, the team estimated. The risk of human cases drops close to zero with that many dogs protected. Transmission from other animals, such as squirrels, raccoons and bats, is rare. At first that sounds crazy, given the oodles of dogs roaming around the world. In Bangladesh alone, there are about 1.2 million dogs, the World Health Organization estimates. But wildlife veterinarian Felix Lankester thinks getting rabies shots for all these dogs is plausible. In fact, he has seen the strategy work in a test case. Lankester, who co-authored the Science commentary, directs the Serengeti Health Initiative, which aims to end infectious diseases in Tanzanian wildlife. For the past five years, he and his team have been driving around in white Land Rovers, setting up makeshift rabies clinics in 185 communities near the Serengeti National Park. 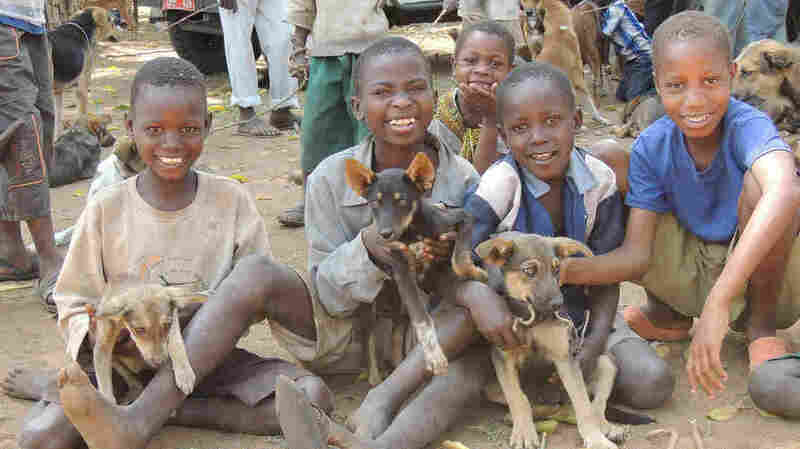 "Most rural villages in Tanzania have firsthand experience with rabies," Lankester says. The team typically begins vaccinating dogs around dawn. The goal is to attract as many children as possible, says Imam Mzimbri, one of the initiative's vets. "Here, the dogs are owned by the children." The interest starts with a trickle, Lankester says. But by the end of a typical day, the team gives shots to almost 1,000 dogs. All the hard work has paid off. Since the program started, the number of rabies fatalities in northeastern Tanzania has dropped from 50 each year to nearly zero, Lankester says. And the strategy seems to scale up to larger areas. Dog vaccination programs across South and Central Americas have yielded similar results. Last year, the two continents recorded only 12 human rabies cases. The World Health Organization hopes to eliminate human rabies in Latin America by next year. Then it aims to wipe the disease out in Asia and Africa by 2020. But the latter will ultimately depend on funding. Each vaccine costs $3, which covers travel expenses and veterinarian fees. On the other hand, treating a person for rabies costs about $40 in Africa and $49 in Asia.